Looking back on my one day trip bike tour with Elena and Piero at Bike Florence & Tuscany, it all seemed so effortlessly perfect. 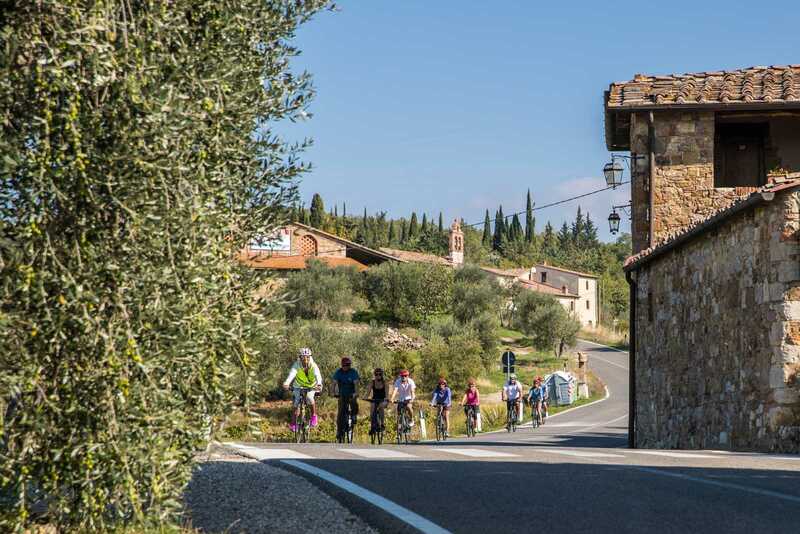 A great group of people meeting on vacation early in the morning to pedal the personalized itinerary comprised of small towns, Tuscan scenery, and wine tasting. 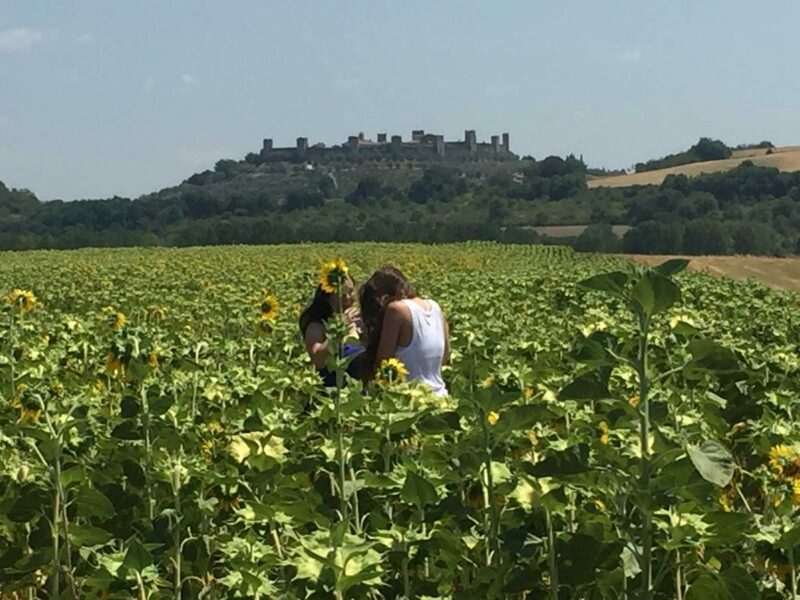 My memories were of a perfect combination of laughter, physical exertion, feeling safe, and Tuscany. A one day bike tour like this just doesn’t happen by magic. It takes experience, knowledge of the area, and a personality that is capable of drawing the unexpected together fluidly. The day started with a personalized pick-up service for participants. It was our first presentation to the day’s group. I was greeted by a couple with a teenager from Australian, an Italian journalist and a fellow single traveler. Elena was good at calculating our individual skill, we all showed a comparable level of perseverance. Credit goes to our organizers who clearly understood that with an 8 am wake up call while on holiday was to be done slow and easy. So our one day bike tour started with a leisurely ride thru the hills of Chianti to a small town. Truly small – it only had two coffee shops! And here they gave us a bit of free time to stroll the deserted cobbled stone streets, take a ton of photos and savor a frothy cappuccino. We were alert now and as we climbed back into the support van, which was to become our constant companion. Even the level of chattiness and familiarity had risen. We were ready to listen attentively to Piero as he gave us bits and pieces of info regarding the Chianti territory, and patiently answered our questions. The roads were quiet and panoramic, the scenery was everything I imagined. Especially the next little town on the intinerary which was as well known as the wine we would be drinking sometime soon: Castellina in Chianti. This is where our bike trek would begin. Yet before we mounted up, Elena encouraged us to explore the “viales” of the town and (surprisingly) some of us were ready for another caffè. Thus far, I would characterized the one day bike tour as well paced. Our guides worked together with the precision of a Swiss watch, and the overall atmosphere was light, friendly and relaxed while each phase slid into the next – effortlessly. Why start the tour off in a van? As an occasional rider, pedaling the all way was definitely beyond my physical comfort level. 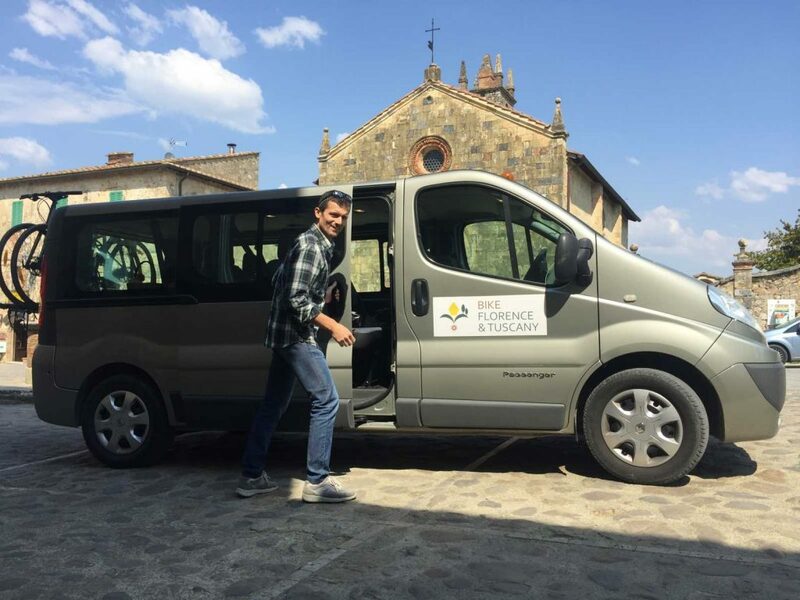 Elena & Piero knew this to be true and spent months scouting out not only the most scenic route featuring vineyards, stone farm houses, and sweeping hills, but they were also looking for the easiest route. It seemed a bit daunting when I signed up: three wine experiences! Ok, actually it seemed a bit decadent not daunting. 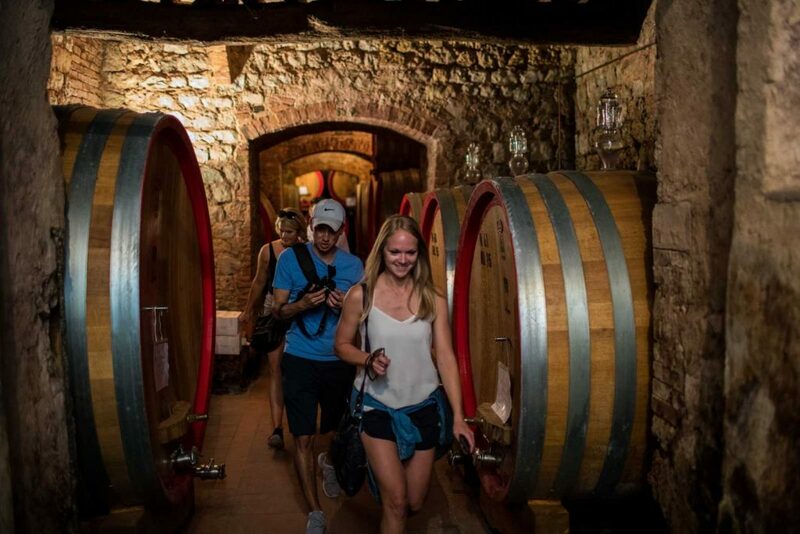 Again, their expertise shines through: they introduced us to three wineries and three very different wine experiences: an antique cantina, as well as wines from all over Italy and a presentation to organic wines and local products like cheese, creams and cookies. Each stop on our one day bike tour was not merely a place to fill our glass, but rather a presentation with passion and professionalism. 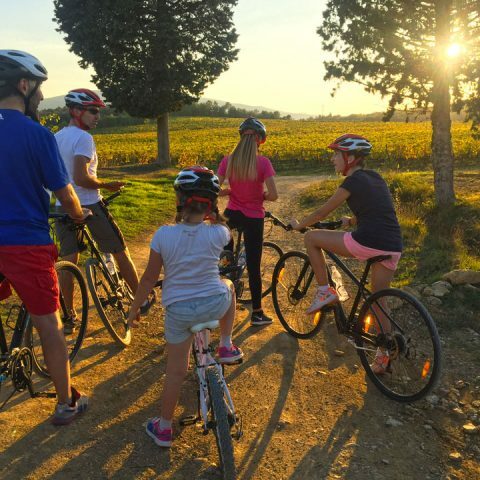 After 2 medieval hamlets, 3 vineyards, 18 miles of scenic roads on our bikes, our one day tour had still not come to an end. Each and every element of the tour naturally flowed into the next, and this was a testimony to the finely honed organizational skills and a well planned itinerary. 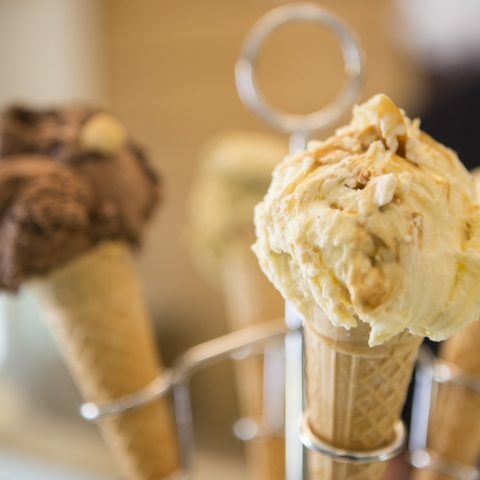 The last stop had us armed with a map, several suggestions of where to explore and a few ideas for gelato and a light lunch! Piero and Elena left us at the entrance to Siena where we enjoyed time to roam the medieval streets of this UNESCO World Heritage city. As we all filed back into the van at the end of the day for the trip back home, we had formed a lively group and had fun with a show & tell of purchases and then shared emails (for an eventual exchange of photos) and some of us took the opportunity to catch a bit of shut-eye before dinner. Between the support van, the attention to details and even the maps, I constantly felt that Elena and Piero had our back. No worries about being pushed into overdoing it, or getting lost or left behind along the way. 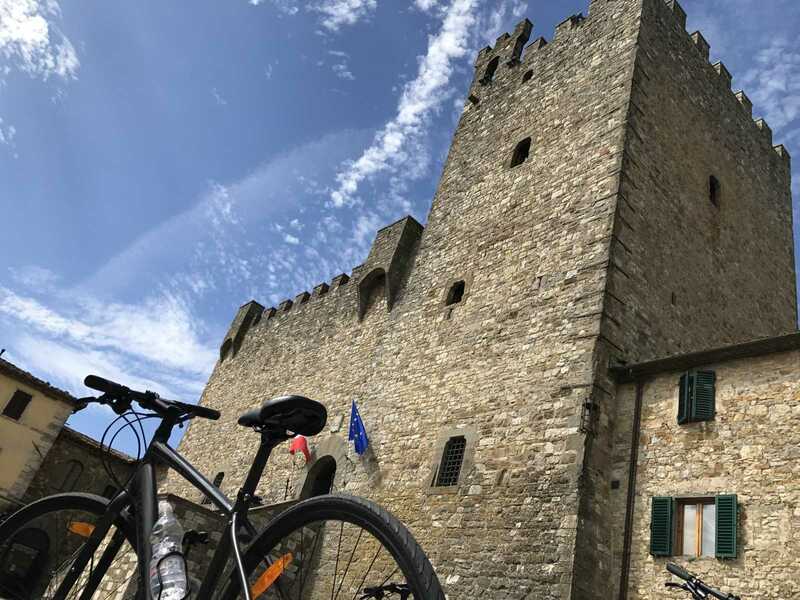 In every case it was clear that the one day bike tour itinerary was artfully designed for both first timers and repeat travelers, and the actually bike time could be extended or shortened according to the skill level of the group. It was a a day filled with the best of Tuscany: picturesque hamlets, panoramic scenery, traditional flavors & dose of architectural beauty.